For greater cutting depths and an even higher removal rate. 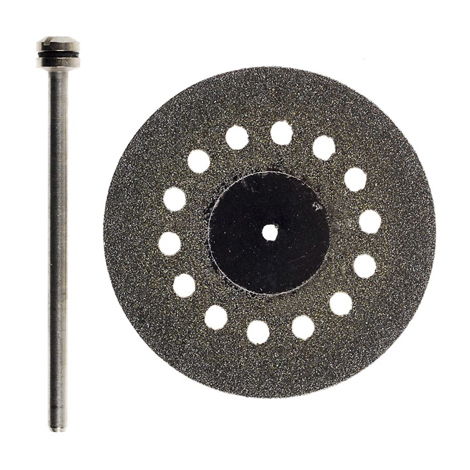 For cutting and grinding hard and brittle materials such as porcelain, ceramics, glass, marble, concrete, stone, non-ferrous metals, plus plastic, glass fibre, reinforced plastic and epoxy circuit boards. Ideal for deburring. 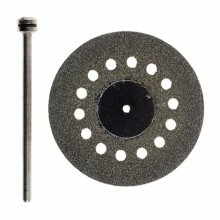 Cooling holes reduce heat generation and prevent burning. Arbor shaft 2.35mm. Click the button below to add the Diamond-coated cutting disc with cooling holes (Ø 38mm) to your wish list.